Juglans alba L. Sp. PI. 997. 1753. 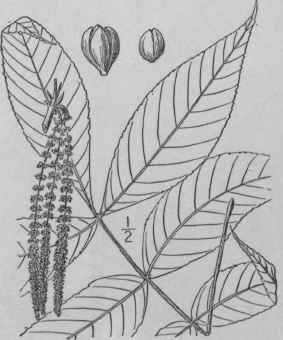 Juglans tomentosa Lam. Encycl. 4: 504. 1797. Carya tomentosa Nutt. Gen. 2: 221. 1818. Hicoria alba Britton, Bull. Torr. Club 15: 283. 1888. 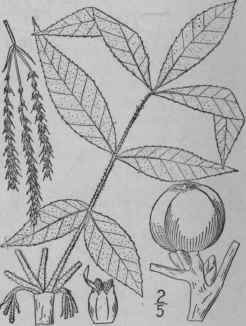 A large tree, maximum height 100°, and trunk diameter 3 1/20, the foliage and twigs persistently tomen-tose-pubescent, fragrant when crushed, the bark rough and close; bud-scales very large, imbricated; leaflets 7-9, oblong-lanceolate or the upper oblanceolate or obovate, sessile, long-acuminate, narrowed or rounded and somewhat inequilateral at the base; staminate aments peduncled in 3's, tomentose; bract of the staminate calyx linear, much longer than the lateral lobes; fruit globose or oblong-globose, 1 1/2'-3 1/2' long; husk thick, freely splitting to the base; nut grayish-white, angled, pointed at the summit, little compressed, thick-shelled, 4-celled at the base; seed sweet. In rich soil, eastern Massachusetts to southern Ontario, Illinois and Nebraska, south to Florida and Texas. Ascends to 3500 ft. in Virginia. Wood very hard and tough, dark brown; weight per cubic foot 51 lbs. Fragrant or hard-bark hickory. King-nut. Bull-nut. White-bark, black or red hickory. May-June. Fruit ripe Oct.-Nov.
Hicoria pallida Ashe, Notes on Hickories. 1896. A forest tree, reaching a maximum height of nearly 100°, with a trunk up to 30 in diameter, the bark rough and furrowed. Bud-scales 5-9, imbricated; leaves scurfy, at least when young; leaflets 7-9, lanceolate to ovate-lanceolate, 2'-6' long, acuminate; staminate catkins scurfy, 3 1/2-8' long; bract of the staminate flower longer than the lateral lobes; fruit subglobose to obovoid, the rather thin husk splitting tardily into 4 valves; nut flattened, nearly white, rather thin-shelled; seed sweet. Dry soil, Virginia and Tennessee to Florida and Alabama. April-May. Juglans alba odorata Marsh. Arb. Am. 68. 1785. Carya microcarpa Nutt. Gen. 2: 221. 1818. H. microcarpa Britton, Bull. Torr. Club 15: 283. 1888. H. glabra var. odorata Sarg. Silva 7: 167. pl. 354. 1895. A forest tree, reaching a maximum height of about 900 and a trunk diameter of 3 1/2°, the bark close, when older separating in narrow plates, the foliage glabrous throughout. 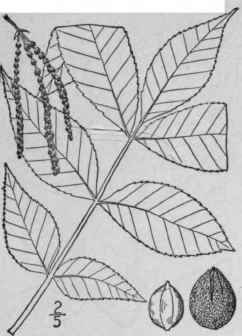 Bud-scales 6-8, imbricated, the inner ones somewhat enlarging; leaflets 5-7, oblong, or ovate-lanceolate, acuminate at the apex, narrowed or sometimes rounded at the base, 3 1/2'-5" long; staminate aments glabrous, peduncled in 3's at the base of shoots of the season; bract of the staminate calyx equalling or somewhat longer than the lateral lobes; fruit globose or globose-oblong, less than 1' long, the husk thin, tardily and incompletely splitting to the base; nut subglobose, nearly white, slightly compressed, not angled, thin-shelled, pointed; seed sweet. In rich woods, Massachusetts to Michigan, Virginia, Georgia, Illinois and Missouri. Wood hard, strong, tough, light brown. Small or little pignut. Little shag-bark. May-June. Fruit ripe Sept.-Oct.